Jump Rock, Macquarie Pass, New South Wales, Australia. Photo: Brad Chilby (http://chilby.com.au). Image©www.thingstodot.com. Clothing: https://www.cream-clothing.com. 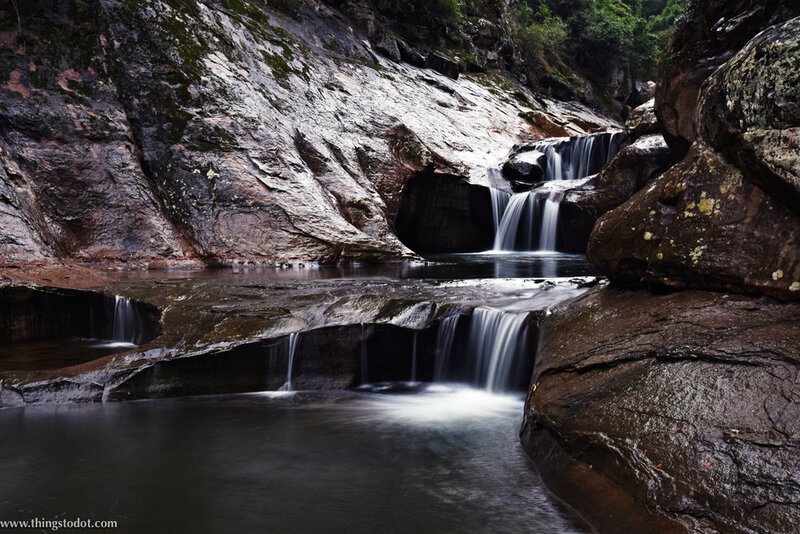 Jump Rock Falls and swimming hole are located at the bottom of Macquarie Pass. If you are coming from Albion Park, they will be on the left hand side. There is also a small car park from where the trail starts. The track can be hard to find and follow and unless you are an experienced hiker, I recommend doing it with somebody who knows the track. If you don't have anybody to guide you, the best thing to do is to keep following the river and it will lead you to Jump Rock. The walk is not suitable for families with little children. The trail is very steep and wears off at times, and it is hard to find your footing in the mud, the tree roots and the rocks. There is a rope on one section of the trail to help you get on the other side where the trail has eroded. I came here with Wollongong based landscape photographer Brad Chilby (http://chilby.com.au) and another friend from Sydney. Brad is an experienced walker and knows the track quite well. He also regularly holds photography workshops at Jump Rock. It was quite late in the evening and raining when we started hiking towards Jump Rock. Walking slowly we navigated our way through dense bush, moss and slime, and climbed over rocks and roots. Heavy rains from the previous couple of days had caused the track to erode in several places and I lost my footing and slipped a couple of times! At one point, I was also attacked by leeches on my leg! After about an hour of adventuring through vines and ferns, we arrived at the falls. I was quite stunned by the beauty of what I saw. 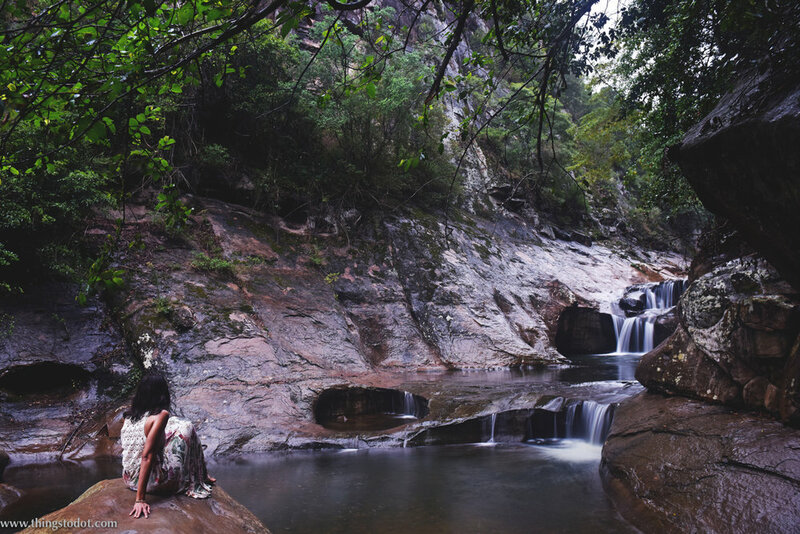 The falls that seemed to magically and mysteriously materialize in this lush rainforest cascaded beautifully over huge rocks to form a perfect pool for swimming. Unfortunately, it had already begun to get dark when we arrived there. We were able to spend only about half an hour at the falls before it got completely dark. We walked back using the torchlight from our mobile phones to show us the way! We also spotted a wallaby as we climbed back up. Even though the weather conditions were not perfect for our hike that day and it was quite late in the day, I didn't want to leave NSW without having checked out the Jump Rock. It was totally worth it! And yes, my hands and feet were covered with thorns and blood when I arrived back at our hotel that night. It took me about an hour to wash off the dirt!